I’m not exaggerating when I say that we probably have several hundred seashells in the house. Most are seashell fragments and most are shells that Cristy has collected through the years. Bottom line is, there is a generous supply. 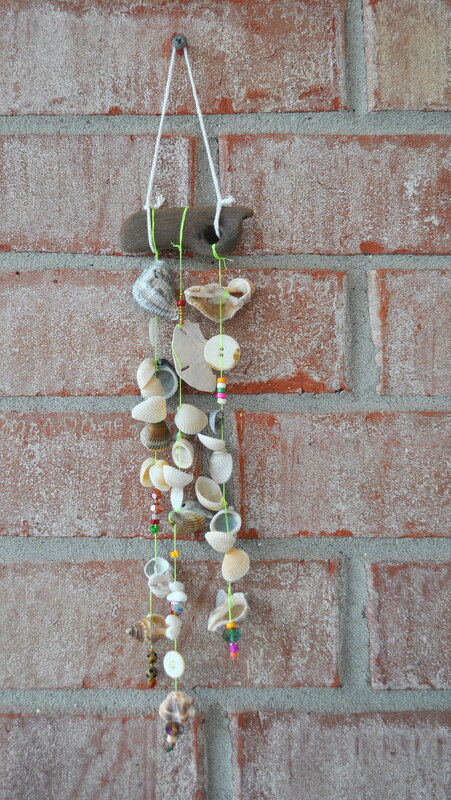 To invite positive energy into our home, I made a windchime today to hang near the back door and used driftwood and seashells. And of course some buttons and sparkly beads. I’m hoping that the soft clinking sound will attract hummingbirds too. Because, yes, it’s migration time again. Adding soft natural music to the landscape. I loved it so much, I made another. As I was sifting through a large bowl of shells, I saw that charming piece of driftwood. 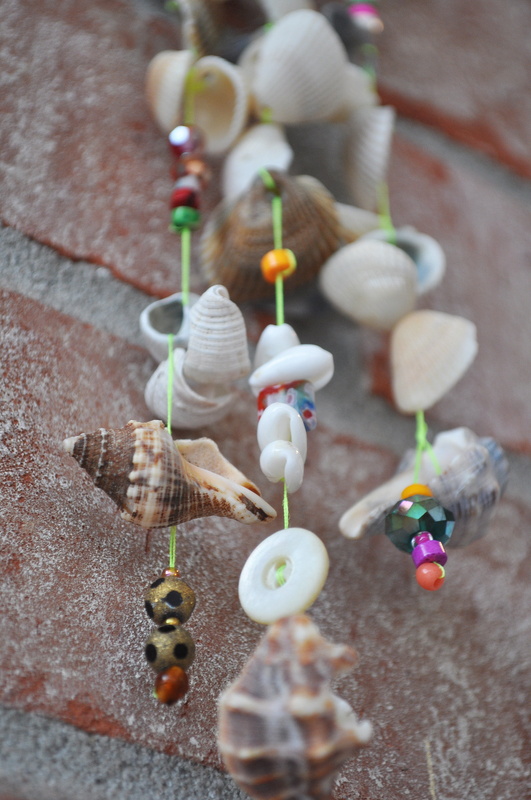 I selected smaller shell pieces and brightly colored beads to accessorize. There are two companions to this project if you’re interested, one with seaglass and the other with driftwood. I only wish I knew you back when I lived in Florida and collected sea shells, yet had no idea what to do with them other than placing them in a basket. I LOVE this windchime, Diane! And the buttons add so much charm! Hey, I didn’t know that about hummingbirds!?! How cool! What a brilliant, brilliant idea! Was it easy to thread the shells on? It looks fantastic. omgoodness, what a lovely wind chime! Beautiful to look at and I imagine it makes a beautiful sounds as well. Love it! Lovely! 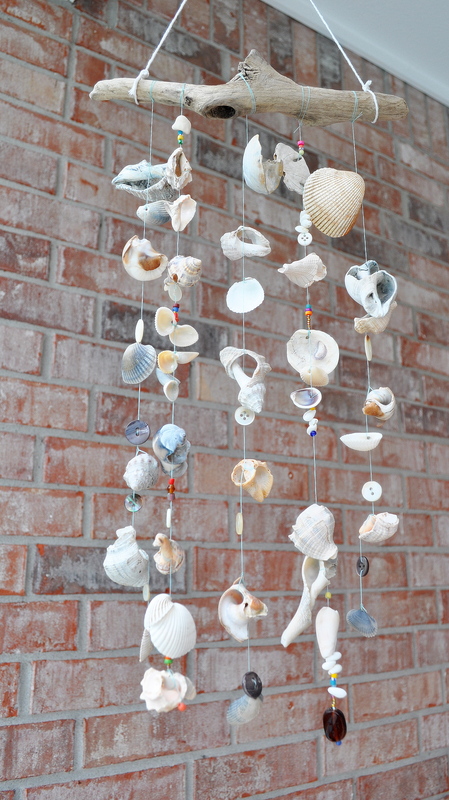 My grandmother loves windchimes, and bet she would love for my boys to make her one like this! Beautiful wind-chimes. 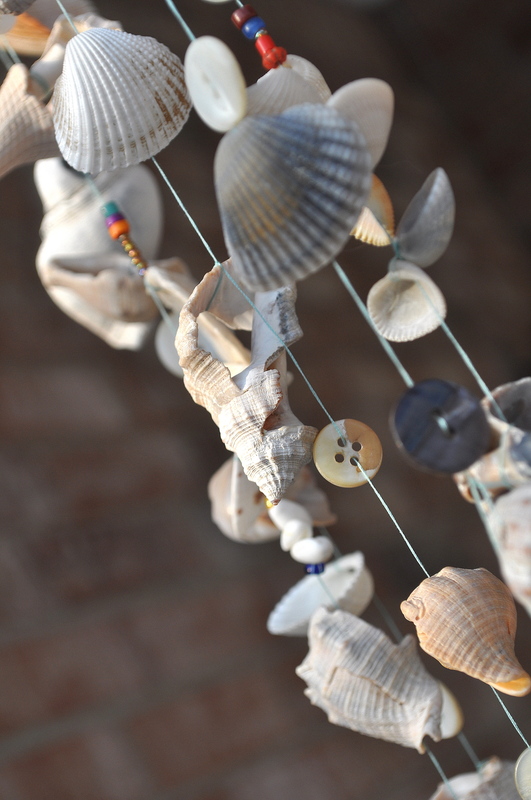 I love DIY and I love seashells and I love wind-chimes too! I’d love to make one, but I’m just wondering, how do you make holes in the shells? Except for those that’s already broken, most of the seashells I have are fully intact. I used my husbands drill with the smallest drill bit to put the holes in the ones i do just have to be easy so they don’t brake and the bits don’t brake as well. 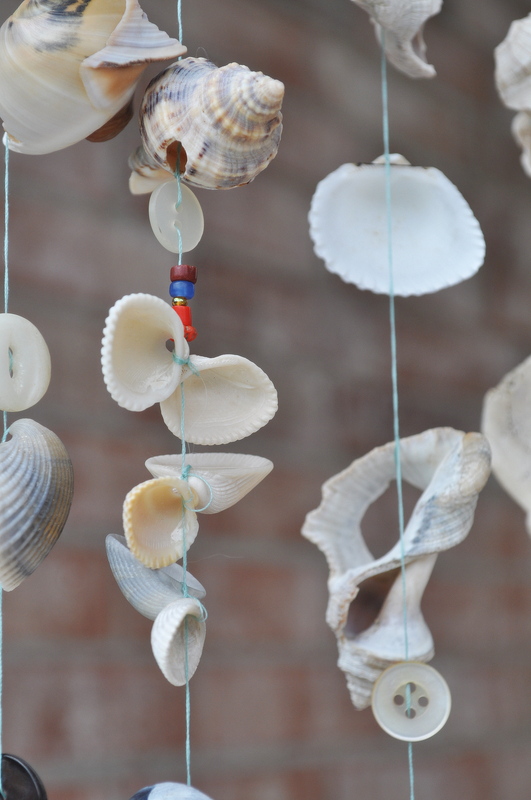 Hello Diane – your wind chime is so pretty, I love it! I’ve got this linked to my nautical post as well today, nice job! I’m not particularly handy, but I do have lots of seashells collected over a lifetime – but I have no idea how to drill (?) a hole in them in order to string them to whatever. Help? 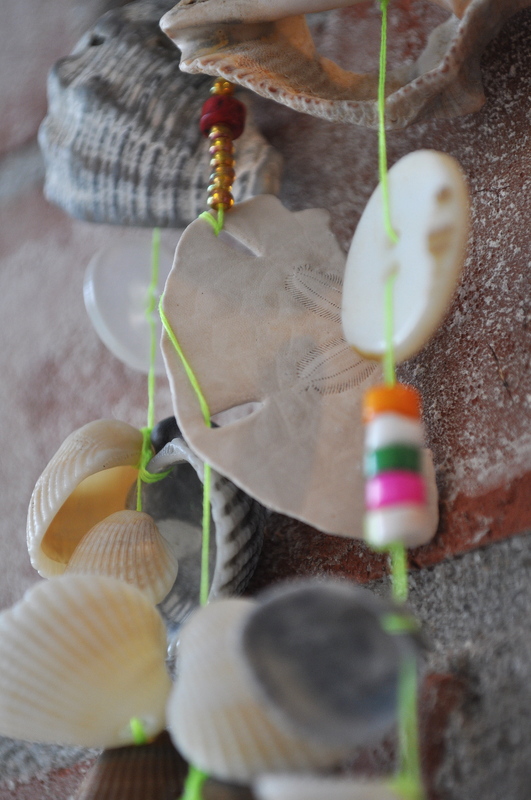 As you see in the photos, I used mostly seashell shards. I didn’t drill any holes. But I can’t imagine it would be very difficult. Just use a drill with a small drillbit. Very nice! Do I have to use a specific yarn…or any kind is ok? I LOVE these. Found them by searching images because I wanted to make my own but I’m having a hard time figuring out the best string. You never mentioned what you used, could you share please? Thanks so much!! Escuela Infantil GRANVIA Vistahermosa » Archivo del weblog » Manualidades infantiles ¡con conchas!